No one denied that Topsy was one temperamental elephant. 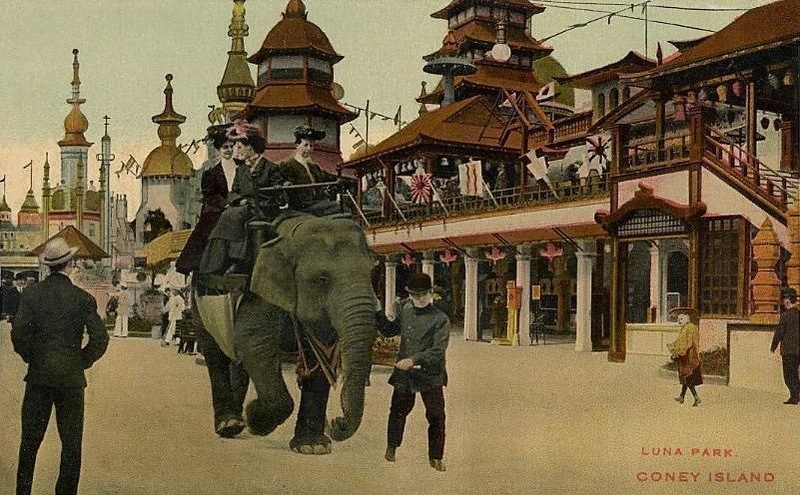 A resident of Luna Park, one of the spectacular Coney Island amusement parks of the early 1900s, the 28-year-old pachyderm had already killed three trainers. Luna Park’s boss wanted her put to sleep. This being Coney Island, he made a show of it. More than a thousand people came to an arena to watch Topsy eat cyanide-laced carrots. She didn’t die though. After considering hanging, Luna Park officials decided to electrocute her. Enter Thomas Edison, who sought a venue to prove that his direct current was safer than alternating current. Luna Park gave Edison the go-ahead. On January 5, 1903, more than 1,500 people watched three-ton Topsy take 10 seconds of alternating current. Her grisly end was soundless and instant. Elephants have a long history entertaining New Yorkers. Read more about it here and here. This entry was posted on June 2, 2010 at 3:29 am and is filed under Brooklyn, Disasters and crimes, Music, art, theater. You can follow any responses to this entry through the RSS 2.0 feed. You can leave a response, or trackback from your own site. Ten seconds? That’s a very long time when red hot irons, so to speak, are applied to every inch of your entire nervous system. She didn’t die instantly or painlessly. Probably the most disgraceful thing EVER to happen to Coney Island. One of the most egregious example of the mistreatment of animals. God Bless these animals that humans do not take care of correctly. You are right–I should have said she “reportedly” died instantly. Accounts at the time also said she died soundlessly but I’m sure her body made a pretty gruesome thud when it hit the ground. anyone able to update wikipedia? Nothing else at that time was that fast. They didn’t have nanoseconds and cyberspace back then, remember. We need to be careful of judging past history by current standards. What we consider cruel and unusual punishment today, would have been unthinkable and unachievable back then. And what was seen as modern and humane then would be unthinkable today. I can’t quite agree with JungleMan’s argument. Yes, we do have to beware of judging past history by our standards, but the reason we judge today that some punishments are cruel is because some people back in 1903 must have troubled by what was going on and wanted to have the situation changed. You can see this from the fact that the killing of the elephant is glossed over in past mythology about Edison, so by the time Hollywood had Spencer Tracy play him he had been truly sanitised. A number of prominent thinkers wee discussing the rights of animals through history, and animal protection laws in the US go back to the 17th Century. We can’t assume that everyone who watched the elephant electrocuted in Coney Island and who watched the film when it appeared in cinemas felt fine about it afterwards. A number of them must have felt sick about what they’d witnessed. Eventually this became enough people. Otherwise we’d still have the same standards of behaviour as 1903.
was instant death: she just fell over, that was it. exactly like a person fainting. elephant a lit cigarette is way out there in right field. robber right after he walks out of the academy. it was a man pretending to feed her. elephant a ride back to Africa. Randy 101 needs to see the Edison film again. Having seen it myself for the first time this evening (it features in Errol Morris’s documentary about Fred A Leuchter), I have to say that it’s just as horrific as it probably was when it was first shown in 1903. It shows the current run through the poor animal, she collapses to the ground in terrifying clouds of smoke, her torso tensed up. Then – presumably the current is switched off at this point – her body relaxes, but her head moves several times. Whether the film is incomplete I have no idea, I’ve watched three versions, and in all three the film appears to cut off before the animal is shown dead. Alas history doesn’t appear to tell us why Topsy killed the first two handlers, but clearly she was abused by the third. 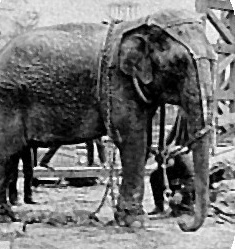 Practically every elephant in the US at that time would have been in a zoo or a circus – no wonder that every now and then one would become angry. Watching the film I felt ashamed for the human race. Incidentally, the most humane and standard way of killing a rogue elephant was to shoot it (see George Orwell’s account), though elephant killers must have decided to try other methods (see the disgusting photograph of Mary the Elephant in Tennessee, a dozen or so years later). I suspect in this case the method was used to test electrocution on a dumb animal. In the case of both Topsy and Mary, the owners managed to get a big crowd for their terrifying show. Topsy, and Mary, RIP. John Gammon I agree. I have viewed the film also and this huge beautiful animal did not die immediately and it was not painless….beside the fact that Topsy had already been fed poisonous carrots, so no one knows how that felt physically. It had to have made Topsy sick, no matter what. It was terribly horrific! Topsy did not die immediately or even in a couple of seconds. Watch carefully the film if you do not believe it. I too “felt ashamed of the human race” watching it. It seriously made me sick. Yes it was done this way for two reasons $$$$ and Edison wanted to prove that his way was better than other ways in the use of electric current. It had no part in really what Topsy was or what Topsy had done. They were just able to get by with it because Topsy had been known to have killed 3 persons (whether they had abused Topsy in any way didn’t matter~was ignored). This fact made it easier to give a reason to destroy Topsy. This all was probably decided after closed talks about the fact everyone could make money on this one and convince the world that it was best to get rid of a ‘killer’ Topsy. If Topsy was so dangerous, why did they take such a chance to move Topsy to the location they were going to do the electrocution at with so many persons surrounding the elephant while making that last walk. Of course, I am talking about ignorant humans too. I forgot to add, it is know that Edison had already before Topsy been doing electrocution on other animals. He killed many animals by electrocution. (One sure will not read that in our books of education, as well as other hidden facts of many of those in our books we teach from. Incidentally, there’s an excellent documentary that HBO have made about the subject called An Apology to Elephants (2013). It’s very timely where I come from in England, as Parliament has recently been discussing relaxing rules on some animals being used in circuses, such as zebras. Animals were banned years ago from British circuses, with the result that if you go to one you’re liable to see a vastly better show. For some reason a group of MPs have been muddying the waters.